Practically every brand and small business has a Facebook Page set up, but chances are, they look like every other page out there. Today, Facebook is revamping business Pages for the first time since 2012 with new features and a fresh design. One major goal is to enhance the experience for mobile users, ultimately proving to businesses that Pages can drive conversions and lead generations. "What we're seeing is an evolution in consumer behavior on our platform," said Benji Shomair, Facebook's director of product marketing for Pages. "As mobile has grown, they're interacting more with businesses, too." The most noticeable change is the addition of a large call-to-action button beneath a brand's cover photo. Marketers can promote three actions—"call now," "send message" and "contact us." In all three cases, Facebook wants to be the middleman between the sales lead and the consumer. As part of the revamp, brands can also add information about shopping and services to their Pages. That means a spa could list all of its offerings, for example. And a small business can more prominently feature the Shopify-powered Buy Button. Facebook added tabs to its design to organize the new features. 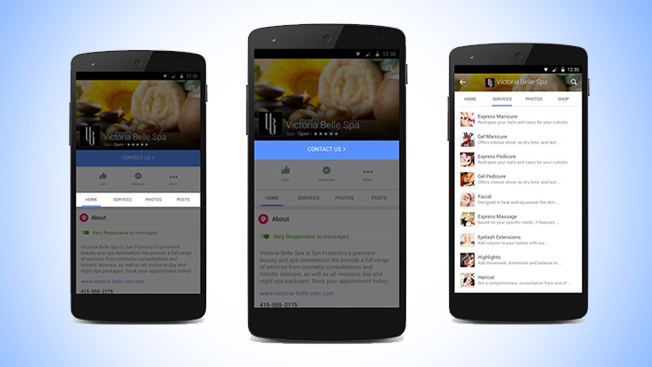 It's no surprise that Facebook is positioning its app as the main platform for small businesses. According to a Forrester report earlier this year, 80 percent of time spent on mobile devices takes place within apps. In March, Facebook started letting brands and consumers chat through Facebook Messenger, an extension of the social platform's flagship app. This new move is a direct hit to Google, which has also been appealing to small businesses with a push to develop ads and content for the mobile Web.